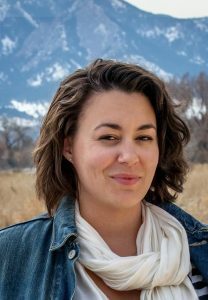 Emily Pumphrey Pearson, BS Mathematics, ’10, is a web-marketing analyst in the restaurant supply industry. 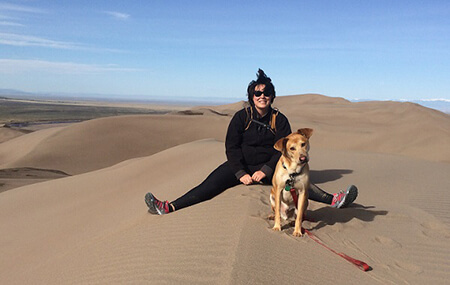 She currently lives in Boulder, Colorado with her husband, Tim Pearson ’06 and their dog, Murray. I transferred to Monmouth from Northern Illinois University in the fall of 2006. At NIU I had tested different majors (philosophy, French, art) before finally settling on my original love, mathematics. When I decided that NIU was not the place for me and set forth to find a new school, the decision where to go was easy – I was born in New Jersey, lived there till I was 9, and had always considered it ‘home’. When Monmouth was suggested to me, I checked out the website, applied that day, and was accepted two weeks later. A few months later I said goodbye to Illinois and packed up my car, heading east to West Long Branch. At Monmouth I was an active member of Alpha Sigma Tau and a lifeguard at the pool. In the math department, I participated in the inaugural summer research program with Dr. Bastian. Originally, Statistics was my least favorite math topic but Dr. B changed that within a few weeks of being in his class. For our summer research program, we worked with Garden State Veterinary Specialists to perform a study on knee surgeries in dogs. This was the single most valuable experience during my time as an undergrad at MU. It taught me that statistical analysis is not perfect outside of text books. It also showed me that understanding what I am analyzing is just as important as the analysis itself. After staying with the marketing agency for a year, I left and moved to Maryland to be with my new husband (another MU alum, Timothy Pearson Music ’06). We decided to move westward and both took jobs in Colorado. I was hired by Tundra Restaurant Supply for the newly-created position of Web Marketing Analyst. At Tundra I function as an internal consultant for the web marketing team, and use my statistical and analytical abilities to help channel owners optimize their performance. After two years with Tundra, my favorite part of my job is that 95% of my work is project-oriented and every day there is something different. Some projects take a few hours and some I work on for months, and I am constantly learning and challenged. My responsibilities extend beyond my department, and I have also been involved in company level analysis and web development projects. At the company level, I helped forecast 2015 revenue and proposed changes to our shipping policy. In the area of development, I have acted as a product manager (a hybrid of a business analyst and a project manager), designed shipping calculators, and created a customer loyalty program, to give just a few examples. I do everything from modelling the financial impact in the beginning of these projects to testing code releases and monitoring and evaluating the short and long term success. My experience with simple coding in Matlab at MU greatly helped my understanding of the logical progression of coding; knowing how developers think and write their code enables me to design project requirements in their language. Although I do not technically use the high-level math I studied at Monmouth in my everyday tasks, I do use logic. My degree in Mathematics was the culmination of 4 years spent constantly exercising the logical part of my brain. Looking at data and being able to see the next 10 steps in a problem helps me to analyze a wide range of situations and make real business decisions that affect my company on a daily basis. My MU mentors, Dr. Bastian – who continues to make time for me whenever I am passing through town (along with Dr. Chrisman and whoever else is around that day) – first enabled me to see the applications of my degree outside of the purely theoretical text book realm.